Here we're all about the fantastic things people can create with a few bits of fabric and a needle and thread. And most importantly, plushies! I want to apologize from the bottom of my heart for all the expired submissions and lack of updates to the club. I have fallen way too behind in this club unfortunately, and it doesn't help that I don't hear from the founder, and the contributors I have haven't been helping out. I do want this club to stay active, as I'm sure its members do as well. However, I have a lot on my plate personally right now, and I just don't have the time or the energy to run the club by myself. I absolutely hate to make excuses, and I know making them doesn't forgive me being inactive. But at the point I'm at now, I cannot run the club without some serious help. I just can't keep up with the submissions. If anyone is interested in helping out send me a note on my personal account letting me know why you think you would be good to help out with the club. At the moment, I'm looking for people just to be able to accept submissions, not for blog or administrative powers. Also, if anyone has any other ideas of what they'd like to see happen in this club (contests, themes, etc), I'd love to hear them! We're a club for plushies of all kinds, whether they be sewn, crocheted, knitted, or through any other media. We accept plushies of all skills levels and of any type! To join, just click on the "Join Our Group" button at the top of the page. Everyone's welcome to join. To submit a deviation go to the club gallery and click the cross next the "Submissions" section. From there you can submit a deviation. Submissions are currently limited to 2 a week per person. Any suggestions for contests, events, or general suggestions for the club are welcome. Just note your suggestions to both VanillaAcolytes and WackyRacky. We accept affiliation requests! Just send us an affiliation request from your group page. Well, the Butler chain has been stopped for now. I now have a new human character that I'm looking to commission. Fabric: Fleece and Minky. No amigurumi. I just really like painted, embroidered or iron on eyes. I do have a budget, I would prefer $55, but can do up to $150. I can do payment plans if anything. I request that if you want to suggest someone or something, please do not link me to company made plush or bootleg plush. The bootlegs come from the cruel labor of Children and I do not like that. Anyone open? Please link me your examples!!!! Hello everyone, I thought I would comment an updated post here since it's been a bit. I am considering commissions for right now. I am looking for Human Plush Artists that I haven't commissioned yet. They are hard to find, I know. But anyway, I am indeed looking for them. Please know that I'm not looking for amigurumi, crotcheted, knitted or needle felt ones. These are NoNos. The yarn thing just doesn't interest me and although needle felt plush are definitely crafted well like a plush sculpture, they aren't snuggly. So, just to sum it up, looking for human plush artists I haven't commissioned before, no yarn or needle felt. If interested, please reply to this comment or note me. Is this group still active? I haven't had my submissions accepted in a while. I felt that my last post was too general, so I wanted to post a new one here to let my inquiries be known. Please know that I'm not looking for amurigumi, crotcheted, knitted or needle felt ones. These are NoNos. Hello, I am looking to commission a Human anime plush. Just nothing amurigumi or crotcheted.... please reply if interested. Thank you! I make Needle Felt Plushies and Accessories and am OPEN for commission! Hello everyone! The holiday season is upon us! I have my own Etsy store for cute, decorative plushies at reasonable prices and I'm excited to share them with you all! Please feel free to browse my gallery and take a look for yourselves! Happy plushing! 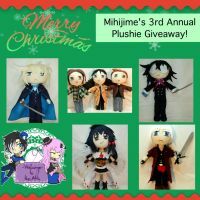 Win a FREE PLUSHIE & more!! !